Beneath the surface of Japan's Tateyama Bay stands a shrine called a torii, sacred to the Shinto religion. But more than being a place of spiritual importance, the underwater site is host to something else that's remarkable - a unique friendship between a man and a fish. For more than two decades, a local diver named Hiroyuki Arakawa has been entrusted with overseeing the shrine and being a guide to others who wish to visit it. 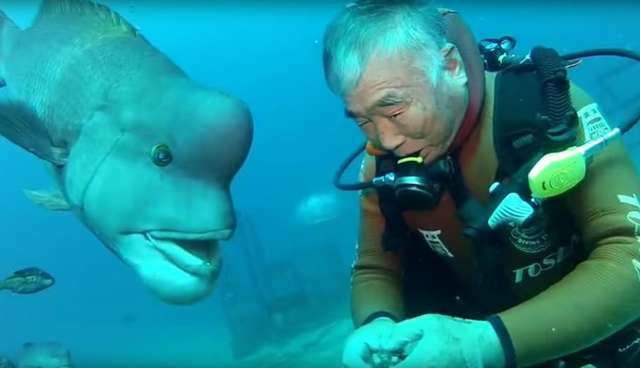 In that time, he's become well-acquainted with the local marine animals who live in the area - including one friendly Asian sheepshead wrasse named Yoriko. Perhaps the sweetest testament to their friendship can be seen in Arakawa's custom of greeting Yoriko with a kiss. Although fish may not be commonly considered particularly feeling sorts of creatures, that's a notion based more on misconception than reality. In fact, a recent study found that fish are smarter and more social than previously thought - and one only need look at Arakawa and Yoriko's quarter-century-long relationship for proof.